"The focus is on...the philosophers and pioneers who had the courage to take the ‘golden step’ from the idea to the deed..."
It is possible to have never climbed a mountain, know you probably never will and still be drawn to the Messner Mountain Museum, Corones (MMM). The museum is located between the Puster and Gader Valleys, 7400ft in the sky on Kronplatz mountain plateau in South Tyrol, Italy. From a distance it looks as if two giant concrete TV’s, with a design nod towards retrofuturism, have sprouted from the earth. The brown landscape, void of trees at this altitude, welcomes the simple structure placed on the edge with views of the surrounding mountains and towns below from gigantic picture windows. Standing outside those windows you will have the slightly ominous impression of being watched—by whom, I will leave up to the sci-fi corners of imaginations. The visual appeal of this museum structure I found gripping art in itself. So much so that I circled the museum several times before even going inside. The unlikely marriage of modern architecture embedded in nature, somehow feel symbiotic. 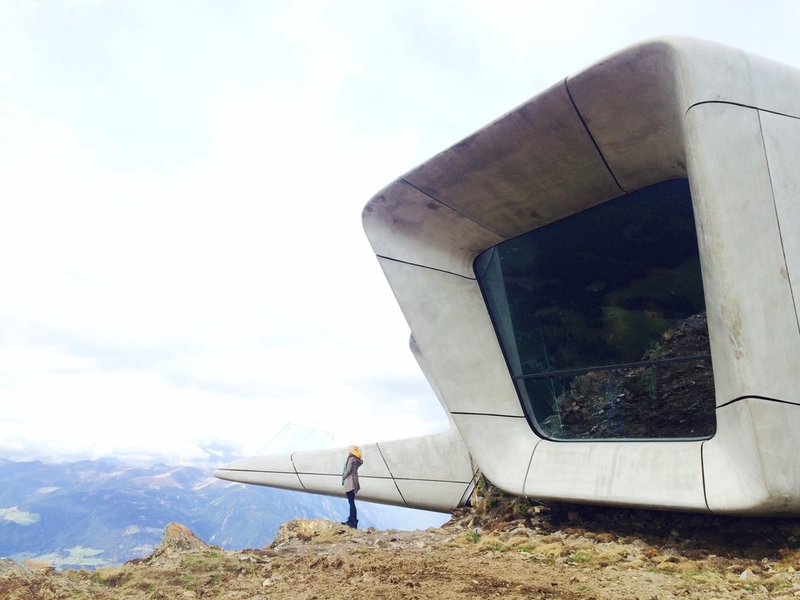 Opened in July 2015, the 11,000 square-foot museum designed by Iraqi-British architect, Zaha Hadid, is the last in a series of six museums or monuments placed strategically across the mountainous region of South Tyrol, by the mountaineer, Reinhold Messner. Reinhold Messner, now 71, was taken on his first climb at the age of five with his father. Messner has spent a lifetime creating a legacy as a mountain climber. He was the first to ascent Mount Everest without supplemental oxygen. He is the author of many books on mountain climbing and the first climber to ascend all fourteen of the “eight-thousanders”—that is, peaks that are over eight thousand meters or 26 thousand feet. The mountains have leathered his face, taken several toes (by way of frostbite), and sadly, the Himalayas, took the life of his younger brother. While the monuments each contain art, relics and equipment, the Messner Mountain Museums are not traditional art or natural science museums. Rather the museums are an individual exploration of an aspect, topic, or a theme of mountaineering and how this particular theme then relates to its own geographical location. In other words, there aren’t rigid curating rules to adhere to and each collection can be unpredictable—just like mountaineering. MMM Ortles in Sulden is devoted to the glaciers and the world of eternal ice; at MMM Dolomites on Monte Rite south of Cortina, the focus is on rock and mountain climbing in the Dolomites; MMM Juval in Juval Castle in Vinschgau relates the myths of the mountain. MMM Ripa in Bruneck Castle tells the story of the mountain peoples; and, the last, MMM Corones is devoted to the supreme discipline of mountaineering. 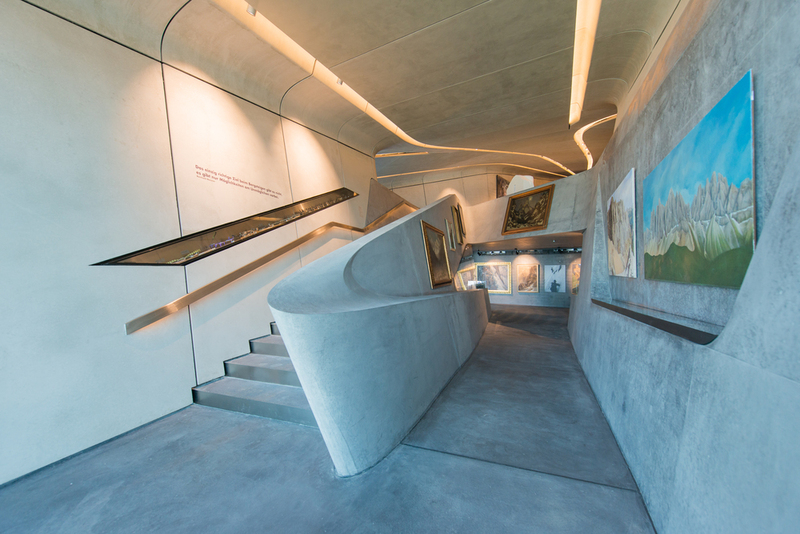 Even for those who don’t climb, getting to Messner Mountain Museum is quite a trek. I flew from New York to Munich, drove south for three hours, passing though mountains and valleys of Austria, to Brunico, parked at the ski-lift and took a nail biting 30 minute lift up. There are other options: for example you could fly to Venice, then drive north for three hours; or connect and fly to Innsbruck Airport and drive for about an hour and a half. Regardless, the drive from any direction is extraordinary and all paths take you through South Tyrol, a breathtaking and picturesque region garnished with quaint little ski towns with chalet type houses, trimmed with flower planters—a melting pot of the region's Ladin, Italian and German people and the subsequent blended ski culture. The MMM Corones structure manages to be contemporary without competing with the existing natural beauty. The monument succeeds in celebrating its surroundings. 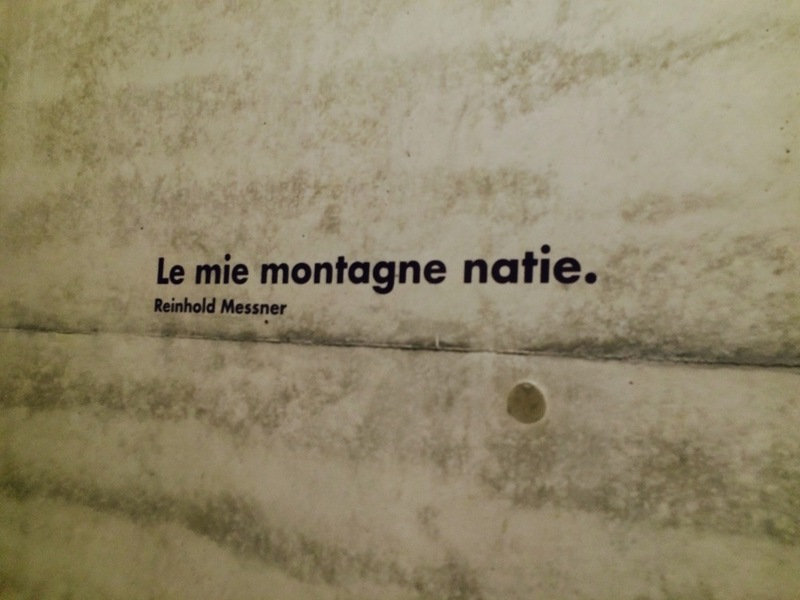 Messner, being the first at many things, has also been the first to create museums dedicated to mountaineering. Set high above, in the element that he loves, Messner inspires those of us who wish to see his museums to go up to great heights—whether by foot or ski-lift—and through that journey we get a taste of the glory to which he has dedicated his entire life. Photography for this piece provided by the Messner Mountain Museum and taken by Inexhibit and Wisthaler, 2015.